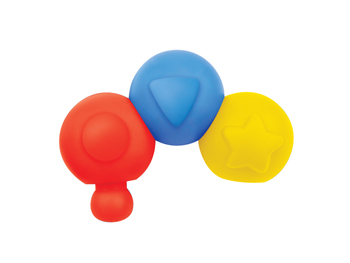 Pop! 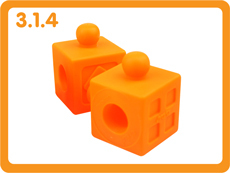 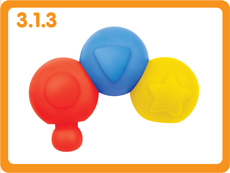 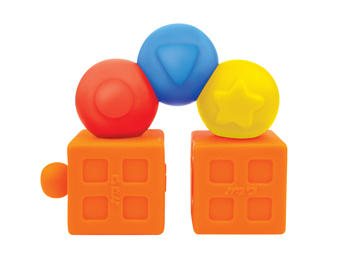 Popbo Blocs are soft plastic blocks you can pop on... and pop off! 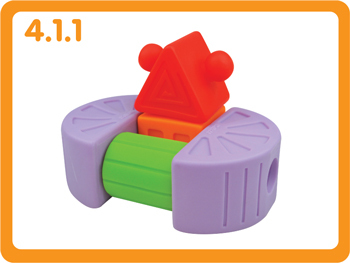 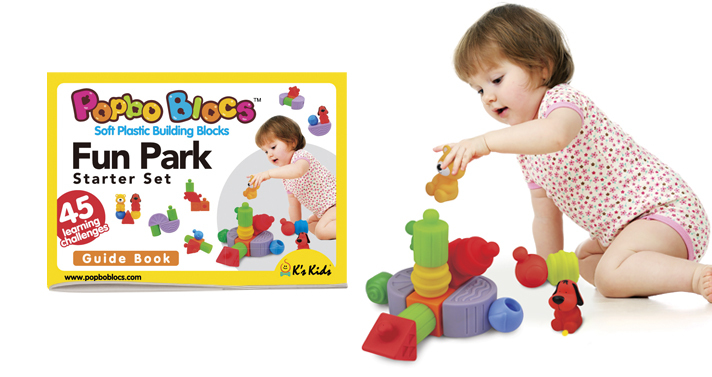 Fun Park is the starter set for toddlers to start the fun building blocks journey with Popbo blocks. 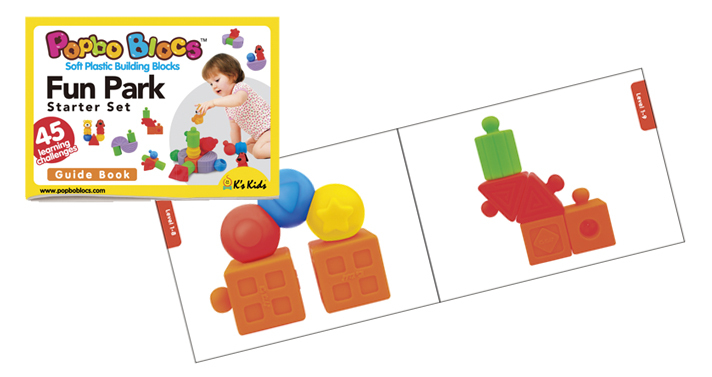 It includes 18 Popbo Blocs of five different shapes, as well as two character blocks. 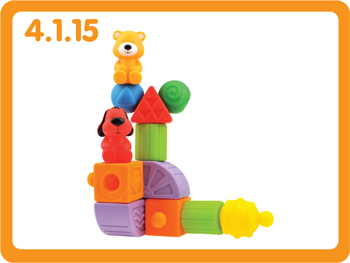 Children will have tons of fun building trees, seesaws, and imaginary creatures! 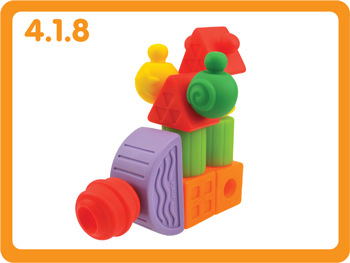 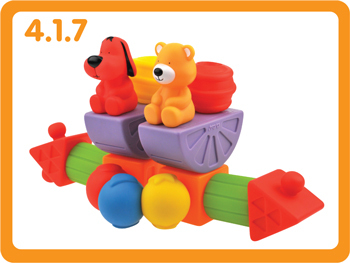 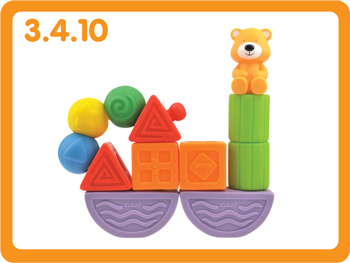 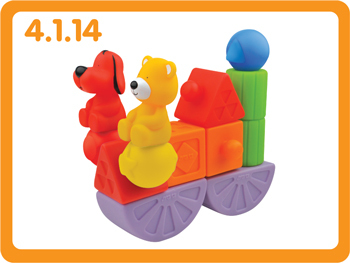 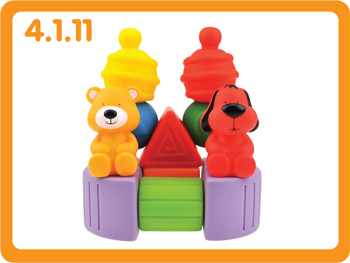 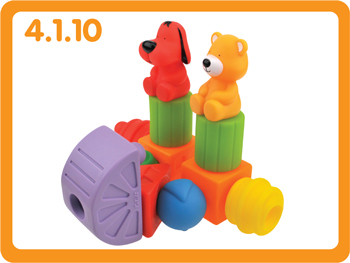 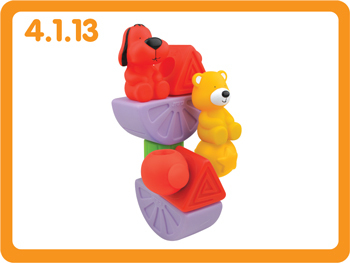 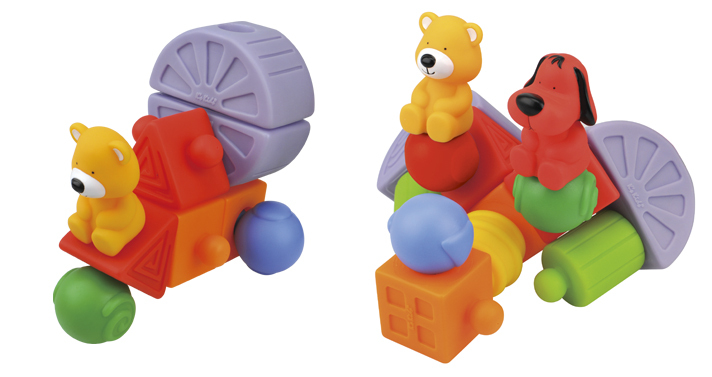 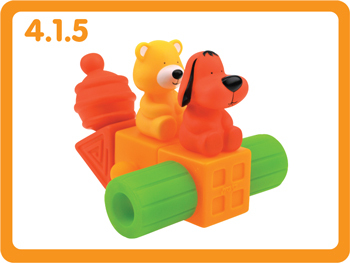 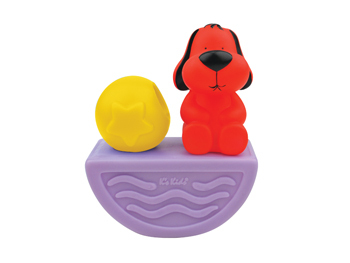 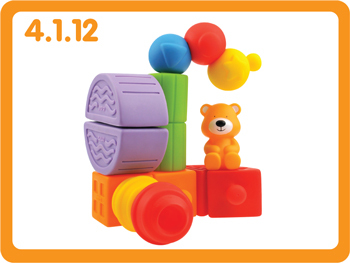 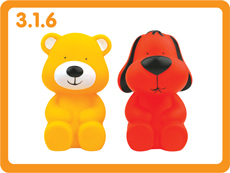 The Fun Park set is compatible with all toy sets from our Popbo Blocs collection. 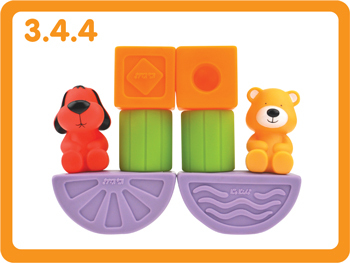 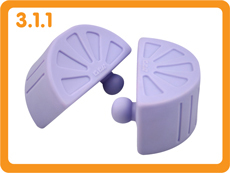 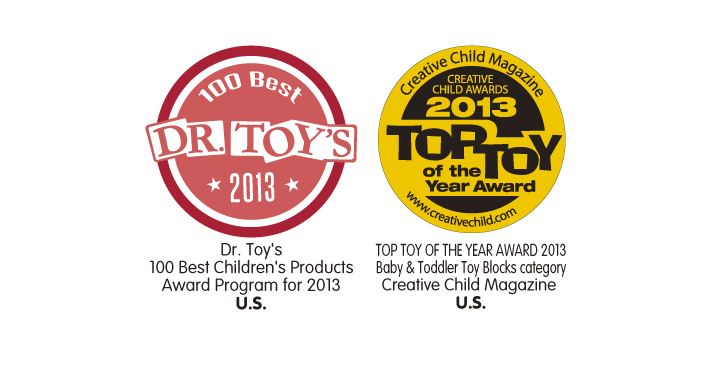 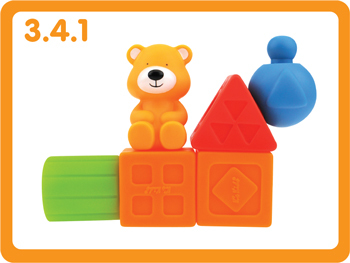 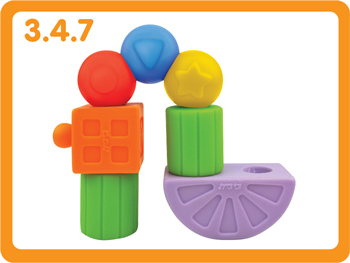 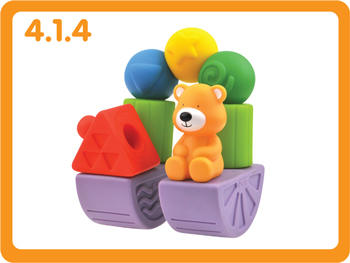 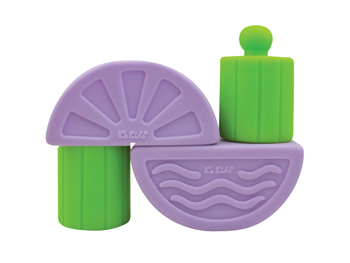 Method: Popbo Blocs are soft plastic blocks of different sizes and shapes. 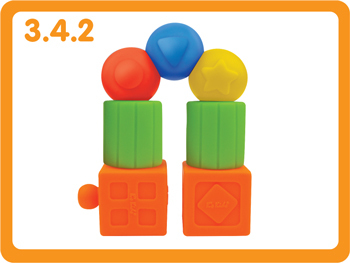 All the blocks have different textures on them. 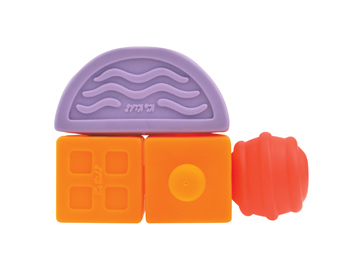 Encourage children to touch and feel the bumpy textures on the pieces. 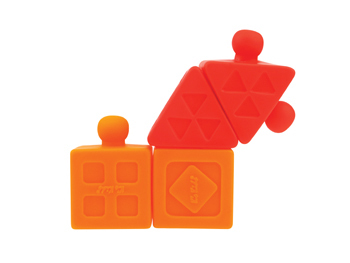 Method: Link any two of the pieces together. 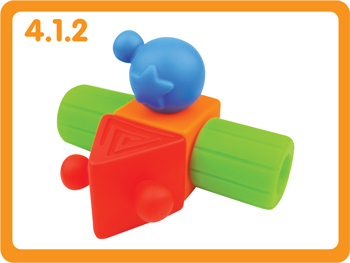 Encourage children to twist them in opposite directions. 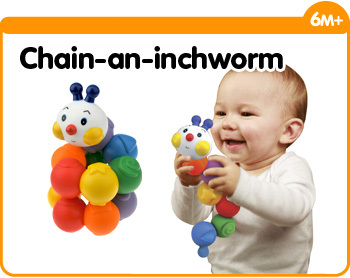 This trains both their gross and fine motor skills. 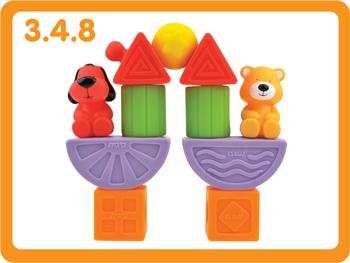 Method: Link any two of the pieces together. 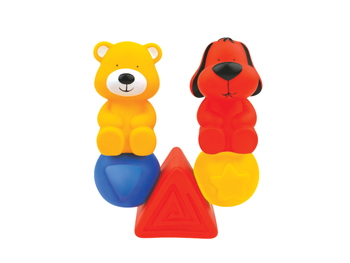 Encourage children to disconnect them by pulling them sideways in opposite directions. 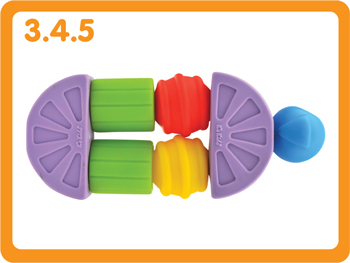 This trains the gross motor skills, fine motor skills and horizontal movement in their hands and arms. 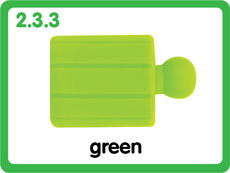 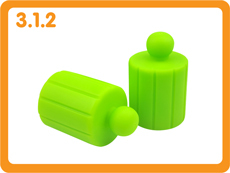 Method: Encourage children to roll the green cylinder across the floor. 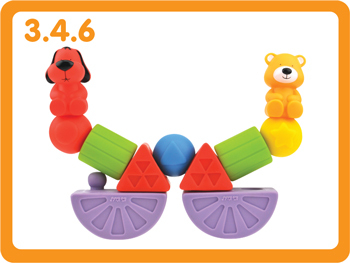 This trains both their gross and fine motor skills. 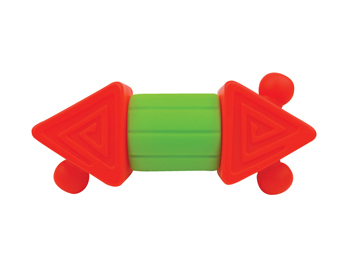 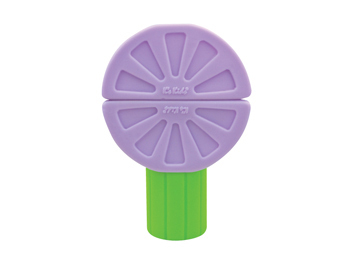 You may also create other pieces to roll by connecting two to three green cylinder pieces, or two purple semi-circles to form a big wheel. 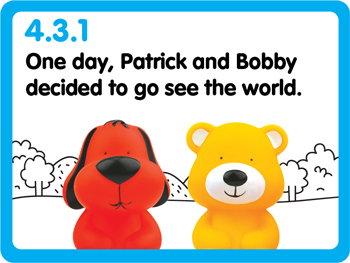 Method: Teach children to identify Patrick and Bobby. 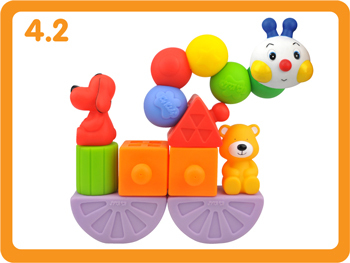 Then use the two characters to teach children facial features and body parts. 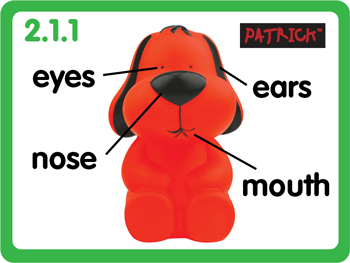 Method: Name a body part or facial feature of Patrick or Bobby. 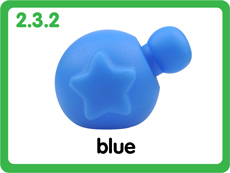 (For example, Patrick's nose, or Bobby's left foot). 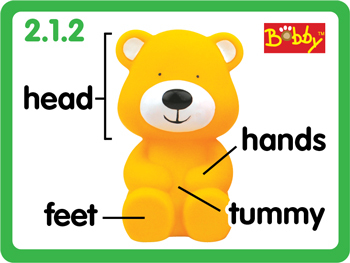 Encourage your child to point to that body part or facial feature. 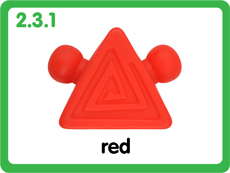 Method: Teach children to identify colors using the colorful pieces. 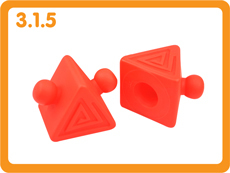 Method: Teach children to identify shapes using the different shaped pieces. 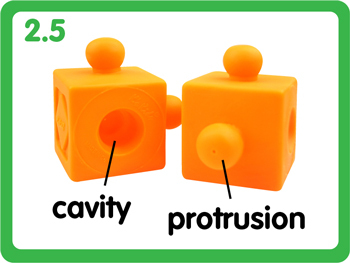 Method: Parents can use the linking sections of the pieces to teach children to differentiate between a protrusion and a cavity. 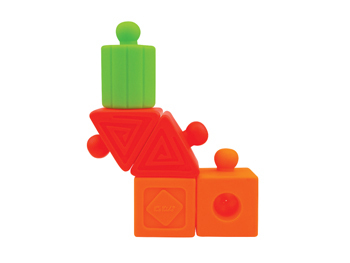 Method: Using concepts learned from activity 2.5, allow children to freely connect the pieces. 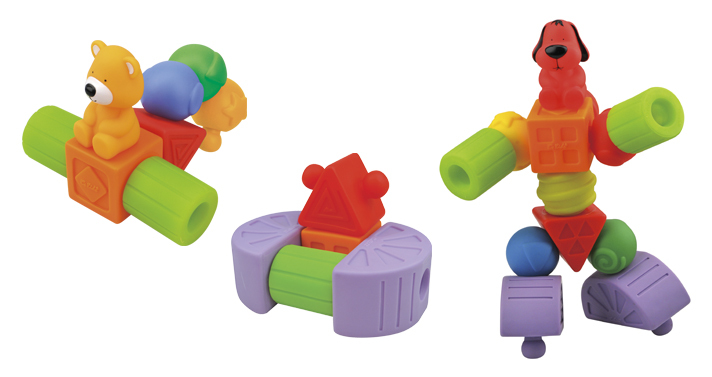 This trains their gross and fine motor skills, as well as their judgement of space. 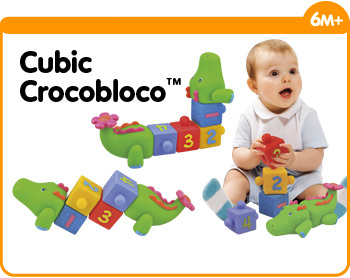 Method: Encourage children to recreate the following configurations. 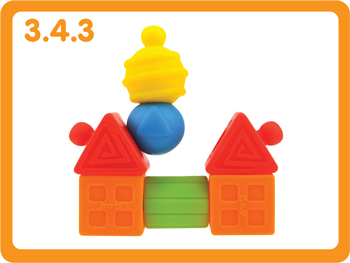 This helps develop their three dimensional and spatial concepts. 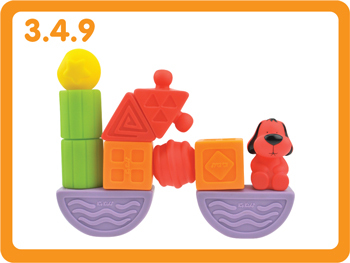 Method: Place all the pieces on the floor and encourage your child to separate them into six groups: five groups based on color and shape, and one group with the two characters. 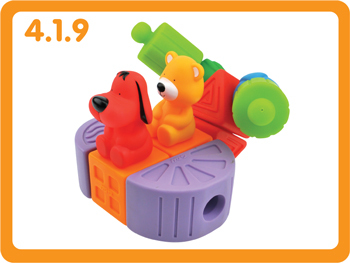 Method: Let children create their own objects or settings with the Fun Park set, and use Patrick and Bobby as the main characters in the setting. 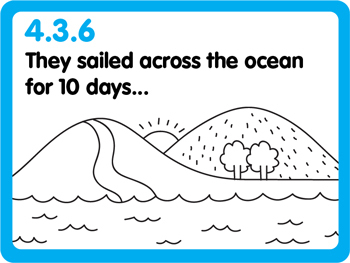 Encourage children to use their imagination to think of dialogue and short stories.